Sometime this past May 2012, we were in need of several dogs to train as Service Dogs. We were looking for a particular type of dog that wasn’t a pup, but not too old, with an even temper and a desire to please. We were introduced to Jake, a 1 ½ year old Labrador Retriever. As a playful pup with a fun-loving personality, he had the drive to please his owner. On Saturday May 26, 2012, we visited Mary S. Roberts Pet Adoption Center in Riverside, California (www.petsadoption.com) to bring home Jake. The next 3 months was spent training with Foster Families, socializing and understanding what drives him. 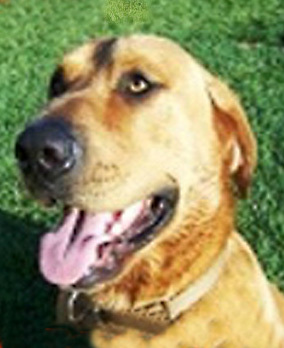 Jake was placed with a family in Temecula, California in September 2012. Dad is an active Service Member and Purple Heart Recipient, Mom is a full-time mom and care giver, Wyatt is an energetic 4 year old boy, and 3 year old Kaitlin who has a degenerative brain disease known as metachromatic leukodystrophy, often referred to as MLD. As energetic as Jake can be at times, he has become very attentive to Kaitlin and those around her. He is protective but gentle enough to not upset her. He has become very aware of the stress levels of the rest of the family and often plays with Wyatt and cuddles with mom and dad when they need a hug. Jake was adopted and trained to become not only a Service Dog but a Companion to his new family. With Kaitlin’s rare disease, she is unable to regulate her body temperature. So Jake becomes her comforter and electric blanket in the winter. In the summer, he blocks anyone from getting too close to her in order to keep her cool. He also provides that emotional support to her as she mostly only smiles at Jake. Jake protects Mama Kristal. She is much more calm when Jake is around which then eases Kaitlin. He also provides play time to Wyatt who sometimes feels left out because of the attention to Kaitlin. Dad Chris is able to manage his service related disability as everyone else has been watched over by Jake. Over the next year, the family will continue to work and train Jake so that he may obtain his Official Service Dog Certification through Big Paws Canine Foundation. Big Paws relies entirely on donations and fundraisers to be able to provide Service Dogs like Jake at no cost to the Recipient. Big Paws assumes all of the costs of veterinary care for the dog as well as continuous training for the dog and owner throughout the life of the Service Dog. We hope this dog’s story has inspired you. If so, please make a donation and help him and other service dogs get the training they need to be a companion for our veterans!